Otto von Bismarck, the first Chancellor of the German Empire, with his favorite breed- the Deutsche Dogge or "German mastiff." Bismarck referred to the breed as "The Dog of the Empire," an important symbol of German national identity in the early years of unification. One of the great misnomers in the dog world is the Great Dane. The dog has very little to do with Denmark, and no one has provided any good evidence that the originated there. However, the current consensus position is that it is a German breed. Its name in most other languages is usually a direct translation of “Deutsche Dogge,” which means German mastiff. However, I think a third possibility exists, one that I think is backed up by some historical accounts of these dogs. I think it may be that the mantle and harlequine (and white, merlequin, and mantle) dogs actually were from Denmark, while the other colors originated in Germany. The first piece of evidence that brought me to this possibility is in Alfred Brehm’s Life of Animals (1896). 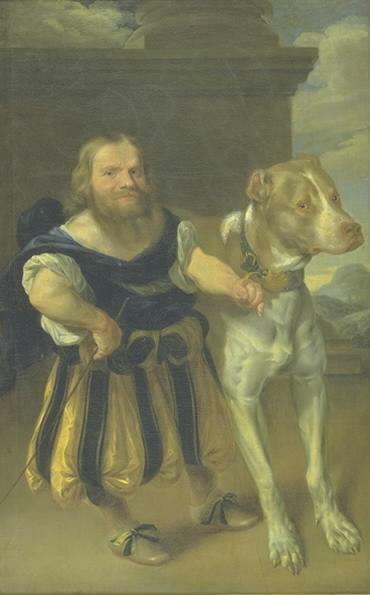 Although Brehm’s book includes images of “tiger” German mastiffs (harlequins), it also shows an image of a “Danish dog.” This Danish dog is a mastiff-type, and it is very similar to some of the German mastiffs in the book. It’s just harlequin. On the next page, Brehm has a depiction of some German mastiffs. The dogs are fawns, but they are virtually identical to the Danish dog in every way. The Danish dog has a thicker coat, but that might be an adaptation to the colder climate of Denmark. To this group [the mastiffs] belongs, in the first place, the Danish Dog…though it may be considered a cross between Greyhound and Bulldog. He is a large, handsome animal of noble shape, has slender legs, a smooth tail and large, beautiful eyes; the muzzle is tapering, but, like the whole body, is of stouter build than that of the Greyhound. Much more common than the Danish Mastiff or Dog is his near relative and descendant, the German Mastiff…distinguished as much for its beauty as its sagacity, and popular in Germany for still another reason. Who has not heard, or, at least read about, Bismarck’s “Dog of the Empire”? The German breeders have been successful in developing this breed (which originally bore the title of the parent stock or that of “Ulmer Mastiff”) to such an extent that for the last decade it has only borne the name of German Mastiff. Its fur is short and thick, both on the body and on the tapering, slightly curved tail. The color is a uniform black, light or dark gray, brownish or light yellow. The lightcr.tints are sometimes brindled with darker hues; and those of a light gray ground-color usually have spots of a darker tinge; while those German Mastiffs that have a fur of uniform color frequently show white marks on breast and toes. The ears are of moderate size, placed high on the head, and are, as a general thing, partially split [cropped] (pg 218). The center for this breed’s development was Ulm, hence the name “Ulmer mastiff.” Ulm is in the modern German state of Baden-Württemberg, but it is on the border with Bavaria. Historically, it has been in both Württemberg and Bavaria, as well as being its own free city for several centuries. If you know anything about German geography, Ulm is in the south of the country. Denmark, while bordering on Germany, borders it to the north. It is not impossible for German mastiffs to descend from the Danish dog, but it seems to me more likely that they were different forms of the same leggy mastiff type. I also don’t think that these dogs were necessarily derived from crossing greyhound-types and mastiffs either, even though this was a common formula for British greyhound breeders to produce a “deer greyhound.” The large genome-wide study on domestic dogs origins places the Great Dane with the rottweiler, a farm mastiff that was not regularly used for hunting. They could have some slight greyhound ancestry, but it is more likely that they are nothing more than modified mastiffs. This relationship with the rottweiler, which is associated with the town of Rottweil in the Swabian Jura in what is now Baden-Württemberg (where Ulm is also located), strongly suggests that southern Germany is the place of origin for the breed we call the Great Dane. However, the evidence suggests that there actually was Danish dog. It probably got absorbed into the German mastiff or modern Great Dane breed. 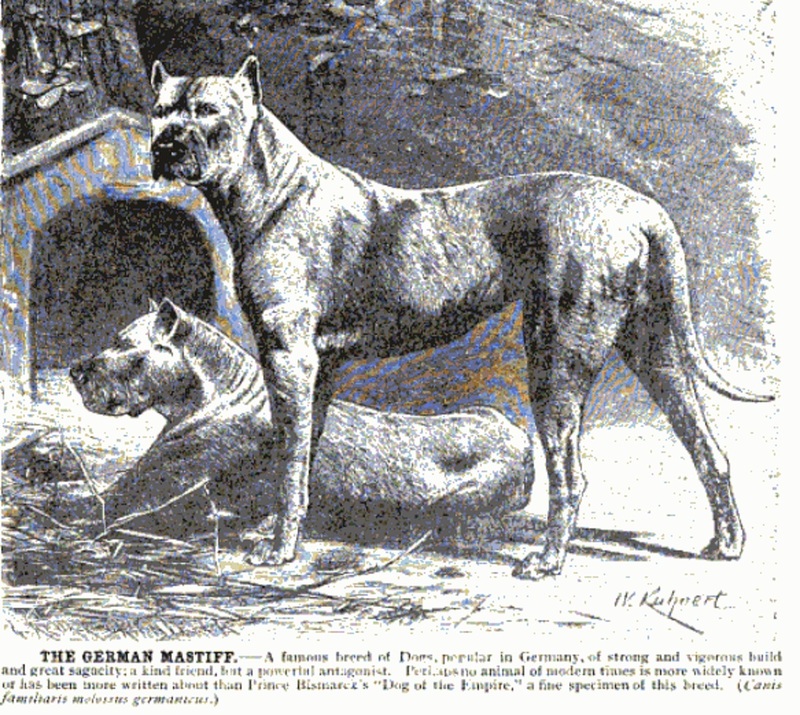 Brehm’s text claims that German mastiffs were not marked in the same way as the Danish dog, but that the two breed’s were similar. Perhaps similar enough to interbreed them to produce the “tiger” mastiffs that also appear in the Brehm book. “Tiger” is the German word for merle, and it is used to describe both dapple dachshunds and blue merle herding dogs. Tiger mastiffs from Cassell's Book of the Dog (1881). Now, my reading of Brehm’s dichotomy between German mastiffs and Danish dogs got me thinking. I had originally poo-pooed the notion that there was any kind of Danish mastiff, except for the Broholmer. But Brehm had me reconsidering my previous assertions. I had to go back to the source. The large Dane, the Irish greyhound, and the common greyhound though they appear different at the first sight, are nevertheless the same dog; the large Dane is no more than a plump Irish greyhound; and the common greyhound is only the Irish greyhound, rendered more thin and delicate by care; for there is not more difference between these three dogs than between a Dutchman, a Frenchman, and an Italian. 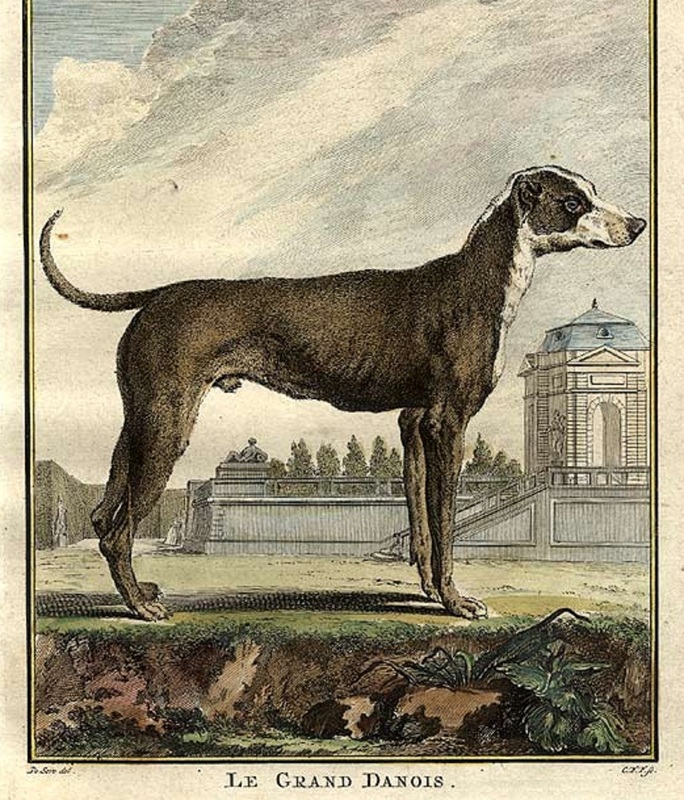 In supposing the Irish greyhound to have been a native of France, he would have produced the Danish dog in a colder climate, and the greyhound in a warmer ; and this supposition seems to be proved by the fact of the Danish dogs coming to us from the north, and the greyhound from Constantinople and the Levant (pg. 321). This analysis suggests that the original Danish dog was in the greyhound family. Perhaps it was a deer greyhound with both mastiff and greyhound ancestry. Other editions of Buffon’s work, show a different depiction of the large Danish dog. 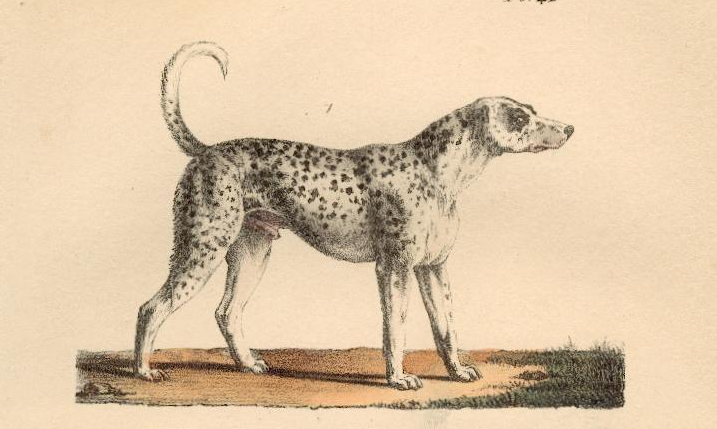 While the original edition depicts a mantled dog, the 1833 edition shows a white dog with speckles. This dog is not a harlequin, if we are to accept the artist’s rendering. It is a Dalmatian-spotted dog. However, there was a tendency to group Dalmatians with the Danish dog, usually under the assumption that the spotting on both dogs is the same. It is not. Dalmatians are a ticked dog with an undetermined genetic modifier that causes them to have “communion wafer” spots. As I’ve noted earlier, the dog we call the Dalmatian today is most likely a derivative of the pointer family. There are, however, dogs that have been called Dalmatians that are more like the harlequin Great Danes or Danish dogs. The Bolognese artist Domenichino (Domenico Zampieri) painted a “Dalmatian” in the seventeenth century. The dog in this painting is an obvious harlequin marked dog that looks like a large sight hound, not a speckled pointer. It may be that the word “Dalmatian” is a corruption of the word Danish. The two words can easily be confused. And somehow, the smaller pointer-type dog got dragged into this name, even though it is of no relationship whatsoever to the German mastiff or the Danish dog. And there are contemporary dogs in Denmark that look like this large sight hound-type. There is famous painting of Raro, a dog bred by King Frederick III of Denmark and presented to his daughter-in-law, Princess Magdalena Sibylle. This painting is also from the seventeenth century. The dog appears to be a “mantle” dog, but it appears to be a dilute liver or Isabella, a color not seen in modern Great Danes at all. This dog is quite similar to the “Dalmatian” in the Domenichino work, albeit with a shorter muzzle. This dog could also be a sable with the liver dilution gene, instead of the more common black sables, which are what most modern fawn Great Danes actually are. It could also be a cryptic merle, like this dog. So there actually were dogs of this sight hound/ mastiff type in Denmark. The only images of these dogs I’ve found have been mantles or harlequins. As Brehm pointed out, the German mastiff breed was fawn, brindle, gray/blue, or black. The six accepted colors in the modern Great Dane are exactly these same colors. However, harlequin doesn’t breed true. 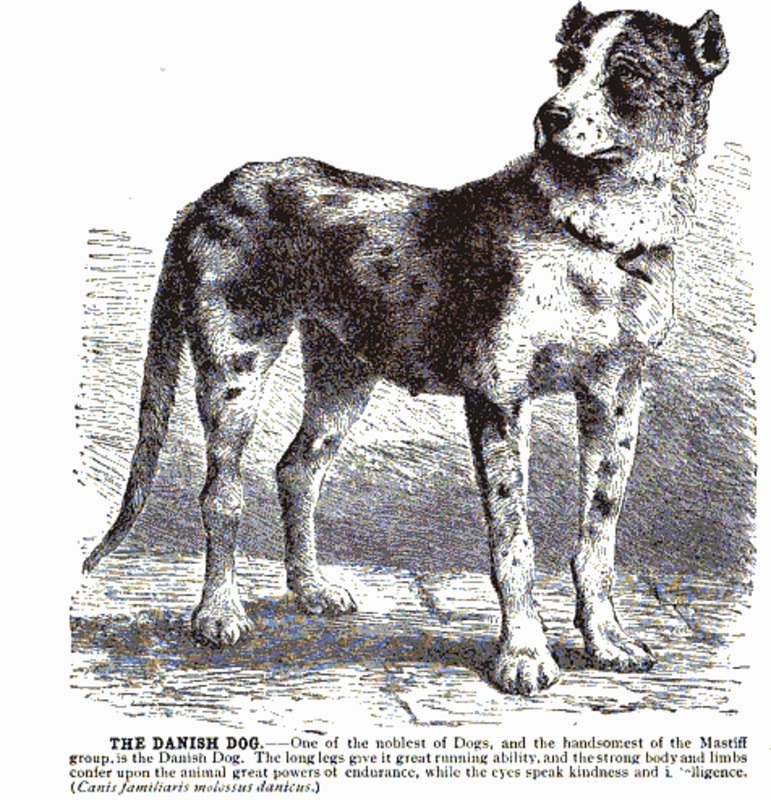 It is a merle dog with one copy of the harlequin gene that was only recently discovered. However, its inheritance was understood, and it was known that breeding two harlequin Great Danes together would produce merles, whites, merlequins, and harlequin puppies. One never could get harlequins, and that is probably why the Danish dogs came in both harlequin and mantle. One of the three “breeding families” in Great Danes is the one where harlequins and mantles are interbred. Mantle or Boston Danes and homozygous black Danes are the only acceptable outcross colors to harlequins. That’s partly because the harlequin gene is hidden when bred to a color other than merle, and the harlequin gene is lethal in utero. That means that one can have severely reduced litter sizes if one is breeding two dogs that unknowingly carry the harlequin gene. There is also an issue with breeding double merles, which is always a touchy subject. A certain number of double merles are going to be produce through breeding single merle to single merle. Some of these dogs are likely to have issues with their eyes and ears. White Great Danes are double merles with one copy of the harlequin gene, and can be produced through breeding two harlequins. All of these are problematic within this breeding family, but if you breed a merle dog to a fawn or brindle, there is a chance that some of the puppies can be cryptic merle. And when one breeds from one of these cryptic merles, one can unintentionally produce double merles– with all the possible health problems. For those reasons Great Danes are still bred in color families. However, I think part of the reason why these dogs are kept in color families is that the harlequins and mantles originally came from different stock than the other colors. They may have actually come from the hunting dogs of Denmark, while the other colors are from an indigenous German hunting mastiff strain, which is closely related to the rottweiler. The German hunting mastiff absorbed the Danish dogs, which were sight hounds with some mastiff ancestry. It is well-known that most show quality Danes are fawn. The secondary show color is brindle. 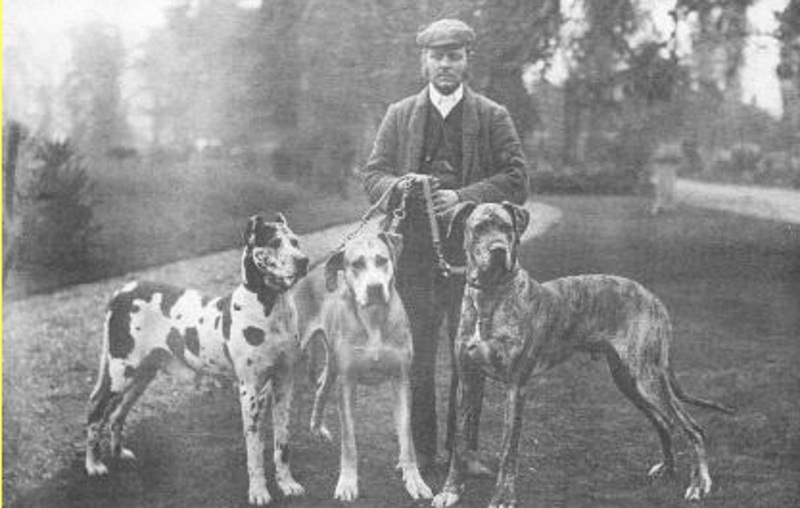 And the brindles and fawns were part of the early “improved” show Dane that was established in both Britain and Germany in the late nineteenth century. Most of the show Danes in Britain in the early days were of these colors, and the early show standard was based upon them. It was often said that blues and blacks lacked breed type, but the blues and blacks formed a color family within the breed, so they were occasionally outcrossed to a fawn of good type. A black Dane that didn’t carry blue would be bred to a superior fawn dog, and the best puppies would then be bred to blacks until they produced no fawns. Then the high quality homozygous blacks would be bred to blues to improve that type. However, the mantle-harlequin family is much harder to improve in this fashion. As late as the early twentieth century, harlequins often were quite different in their body types from the standard fawns and brindles. 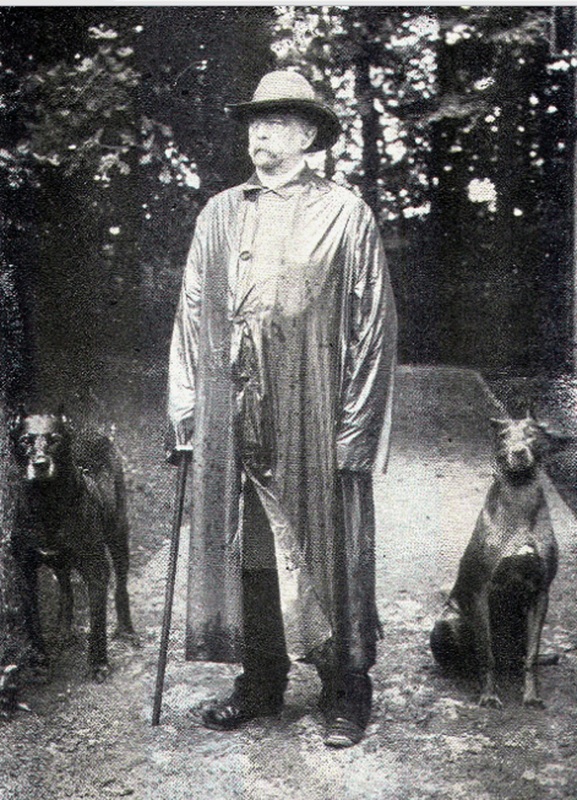 This photo of three Redgrave Great Danes includes the well-known Ch. Viceroy of Redgrave standing next to what has to be an imported harlequin. I say “has to be,” because the dog is cropped, and ear-cropping was banned in Britain in the 1890’s. Ch. Lot of Redgrave (harlequin), Ch. Viking of Redgrave (fawn), Ch. Viceroy of Redgrave (brindle). 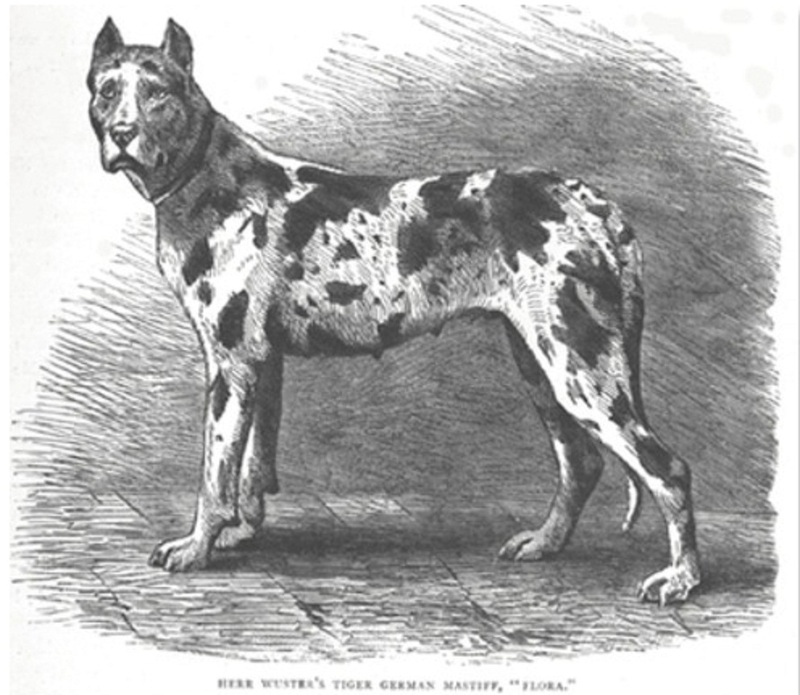 This shows that the harlequin or tiger dogs were of a different type than the more established show lines of fawn and brindle. 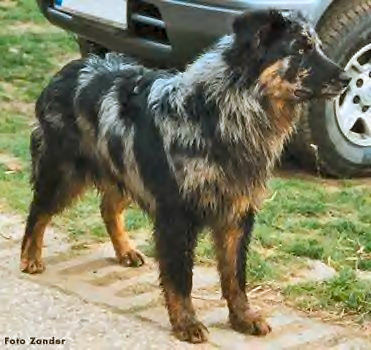 This different type may be the result of the harlequins having a slightly different ancestry than the other colors, which I contend were the real Danish dogs. The German mastiff is the modern Great Dane. However, there actually was another Great Dane. Buffon’s Great Dane, sometimes called a Dalmatian, was actually a large sight hound that was closely aligned with both old Irish wolfhound and the greyhound. The dogs may have been nothing more than unusually colored Danish deer greyhounds, which were greyhounds with some mastiff ancestry. I don’t know of merle sighthounds off the top of my head, but all European sight hounds are closely related to herding dogs, which are famous for their merle coloration. The German mastiff or boarhound breed became popular as a pet, because it became a potent symbol of national unity within the German Empire. The improved pet German mastiff of the early German Empire absorbed the remaining Danish dogs– in a sort of parallel to how the Prussians conquered Schleswig and Holstein and later saw to it that both were made part of the German Empire. But there actually was a Danish dog. It now exists only in the splotchy harlequin-mantle breeding family of the Modern Great Dane. German mastiffs and Danish dogs became the Great Dane. A Danish breeder, Fru Madsen was a famous harlequins already in the 1800s-early 1900s. I think CH Lot of Redgrave was probably from her kennels. BT, they must have been fonded of these spotted animals in Denmark. You know they also have the Knabtrup, a dappled horse breed, originating from the 1810s. Fascinating theory… I think the photo of divergent type fully supports the notion that unique origins separate the harlequin color family. –very different from the similarly identified dog circa 1945 shown here: http://www.notrehistoire.ch/photo/view/12595/ who looks rather like a giant Bernese. The modern Belgian dogs are an apparent recreation and therefore irrelevant to a historical discussion. They probably very similar to the landrace from which all of these dogs descend. The Flemish Belgians called theirs Trekhonds or Rekels. Someone’s YouTube channel spambot needs to be run through Google Translate a few more times.